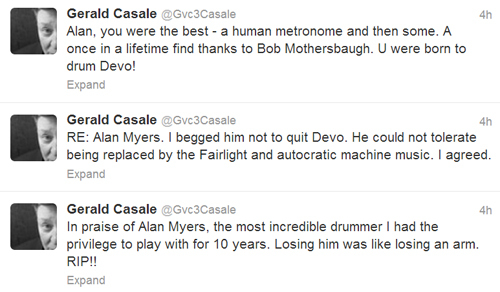 Alan Myers, the drummer of 'classic era' Devo, has died due to complications with cancer. He died on the 24th June 2013. This is incredibly sad news for any Devo fan as even after he quit the band (following the 1984 album Shout) he was always seen as THE Devo drummer, a "human metronome" who slotted so perfectly into the band and really defined what the band was all about. It was his presence in the band that really propelled the band forward in the early days. He provided the foundations on which the rest of the group could build tracks on, his playing was simultaneously precise and robotic yet human and full of charm. As the group relied more and more heavily on programmed drums his role within the band became smaller and smaller, Shout was the last straw and after its release he left the group never to return. Most recently he played in a live version of John Frusciante's group Swahili Blonde alongside his daughter Laena Geronimo on bass. He led a private life after Devo and very rarely gave interviews, although he will feature in the forthcoming Devo Documentary in a rare interview session that was granted a few years back. Alan Myers will be deeply missed by the many incredibly passionate Devo fans out there, my heart goes out to his family, rest in peace Alan Myers.